It's interesting how Christie enjoys taking questions & sparring with reporters -- yet he seems very measured in this news conference. My favorite @GovChristie quote today to @JohnKingCNN : "I don't think I've gotten to the angry stage yet, but I'm sure I'll get there." Christie hasn't had a lot of sleep last 2 nights, but didn't know anything about the emails until yesterday morning's call from comms dir? In Dec. Christie hinted at a '16 role for Stepien-saying he liked having him "available to do additional work for me in the political realm"
Christie asked if his apology extends to the press. "Yes of course it does," he answers. "I came out here and said something that was untrue." "In this instance, my government fell short and I take responsibility for that," Christie says. Gov. 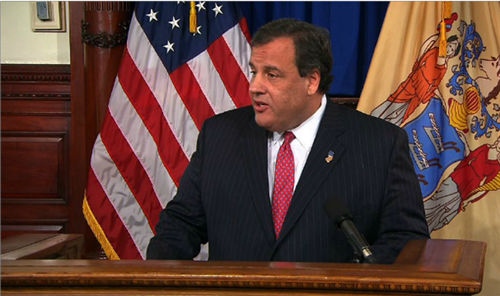 Christie: "I have not had any conversation with bridget Kelly" since the email came out. Christie says he has not had a conversation with Bridget Anne Kelly, his deputy chief of staff that he fired this morning, since the emails came out Wednesday. He says she has not been given an opportunity to give her explanation. Christie says quite frankly he's not interested in hearing it. more questions about the people affected, fewer about the press corps, please. Boehner said didn't watch Christie presser, but asked him CC handled to be viable 2016 candidate - response: "I think so"
In December, Christie was asked about the lane closures at a press conference in December. Christie responded sarcastically: "I moved the cones, actually unbeknownst to everybody." Christie now says he apologizes for that joke. He says he made it at the time because he thought the allegations were "absurd and we had nothing to do with it." Some Twitter perspective: Jay Gruden trending nationally -- right above weather, #ChrisChristie comes in at number 3. "I found this out at 8:50 yesterday morning. By 9 this morning, Bridge Kelly was fired. By 7 yesterday evening, Bill Stepien was asked to leave this organization," Christie says. "That's pretty swift." Christie says that despite your best instincts sometimes "people are a mistake hire...you can't prevent everything." "But the test of leadership is: When you find it out, what do you do?" he added. Getting close to an hour here. 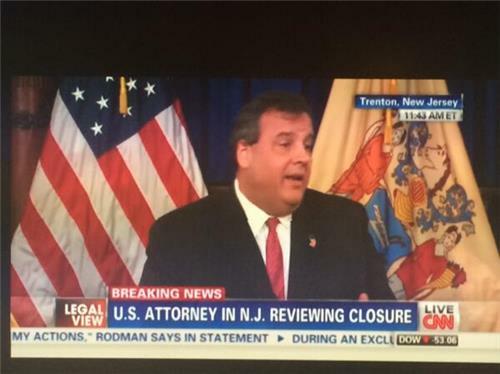 Christie likes Obama-length pressers, it seems. Christie says there is always tension between New York and New Jersey over the Port Authority. But he says there is no tension between himself and New York Gov. Andrew Cuomo. Christie: "I don't know what makes a legitimate traffic study." We have a winner: RT @samsteinhp : Halperin and Heilman's next book: "Lane Change"
Boehner on whether Christie apology is sufficient: "I think so." At House Speaker John Boehner's weekly press conference on Capitol Hill, he was asked if he got to see any of Christie's press conference. "No, I wasn't fortunate enough to have that opportunity," he said. Can @GovChristie survive the #GWBridge scandal? We debate on #Crossfire tonight at 6:30pm ET. Christie's most recent approval rating in NJ: 65% last month in a Monmouth Univ. poll. It didn't get a lot of coverage. The next poll will ! Christie has not said anything about EMS services that were delayed during the week of the access lane closures. Emergency crews were delayed in reaching patients because of the traffic gridlock, including one elderly woman who was having a heart attack. Read our story here. Can we do away with canard that we're three years from an election? Iowa 2 yrs away & primary campaign begins in earnest this Nov.